Weeds come in all shapes and sizes. The same could be said of weeding solutions. We’re here to tell you a few of the more effective ways you can tackle weeds in your garden. Weeds need light and water to grow, so seeds that lie in the top layers of soil have the best chance of germinating. Any weed seeds deeper than 5cm in the ground will remain dormant. To avoid bringing these dormant seeds to the surface, minimise soil disturbance. And if you have to dig, cover the patch with mulch. Tip: use a sharp knife when weeding lawns for minimal soil disturbance. Mulch is a handy ingredient to have on hand because it ensures moist, cool soil for your plants and it minimises light from reaching any weed seeds. Certain organic mulches can also host bugs that feed on weed seeds. So, be sure to top up the mulch from time to time. Certain weather conditions will inform the type of weeding methods you’ll choose to use. Stick to the old saying: “Pull when wet, hoe when dry”. Wet soil makes it easier to pull weeds out by the roots. Tip: Use an old fork where you need to twist and pull them out. 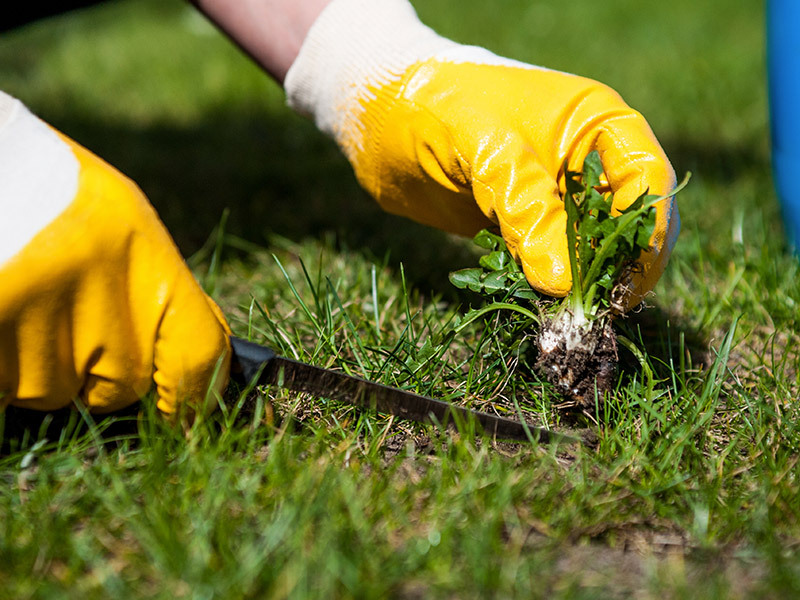 When soil is dry, chop the weeds just below the soil line – this will kill them without needing to pull out the roots. And sometimes you’ve got to bring in something a little more effective – like herbicides. If you’re new to herbicides there are a few things you need to know. Herbicides can be very specific, so when selecting one, do so with extreme care. They fall into two main categories – Selective and Non-selective. The former controls particular types of weeds that fall into the broad-leafed or grass-like weed category. The latter control and kill all types of plant life that they come in contact with. Selective herbicides we suggest: Efekto Hormoban APM, Efekto Turfweeder 457,5 SL, Efekto Banweed MCPA and Efekto No-Weed Lawn RTU. Non-selective herbicides we suggest: Efekto No-Weed Paving RTU. Another thing that’s vital when looking at herbicides is the timing. Pre-emergence herbicides halt weed growth before they have sprouted. These are most effective when the entire area is targeted, so try to avoid missing patches. Pre-emergence herbicides we recommend: Efekto Snapshot 2.5 G.
And finally, Post-emergence herbicides help to control weeds that have already sprouted on lawns or paving areas. This is the best herbicide when you need to spot treat a certain area. Tip: always read the label on the herbicide before use as certain types may harm your plants if used incorrectly.